Much of Indonesia lies over the ominous-sounding Ring of Fire. Marking the border where the Eurasian, Australian and Pacific tectonic plates meet, the landscape is pockmarked by countless volcanoes and grim lava fields. But this is also a land of breathtaking scenery with abundant flora and fauna. Everyday, thousands of visitors forego a good night’s sleep to catch the sunrise at the summits of Mount Ijen and Mount Bromo. Located at least a half day’s drive away from each other, Mount Ijen and Mount Bromo offer different experiences to visitors. It’s advisable to engage a tour operator to organise a 3-day trip, as arranging for public transport is pretty challenging in a tight timeframe. A tour guide might also be able to bring you to their favourite secret sunrise spots, which might involve slipping under a nondescript gate. In this itinerary, you’ll learn how to visit both iconic volcanoes over a weekend, and make it back to office with amazing stories to share. From the Javanese city of Surabaya (second only Indonesia’s capital, Jakarta), take a 5 hour drive out into the countryside and into Bondowoso to stay the for the night. Rest early on this day and recover from any possible jetlag, as you’re going to wake up very early over the next two days. Wake up at 3am and drive 2 hours towards the to catch the sunrise over the vivid aquamarine blue crater lake of Mount Ijen. This volcano is also (in)famous for its dangerous sulphur mining operations, which is largely carried out and transported by hand. From the entrance of the trail, a local guide will be required to bring you up. The path is moderate, although sections of steep slope require some fitness to overcome. If you need help climbing up, enterprising locals can carry you in a small carriage for a fee. From the rim of the crater, the lake shimmers with a shade of luminous funky blue-green. Unfortunately, the water contaminated by hydrochloric gas and is highly acidic. You’ll want to stay clear of any water in the lake, and streaming down from the top. You may also spot ghostly blue flames emerging from crevices in the ground. Formed when sulphuric gases combusts underground and then shoots out under high pressure, some plumes of glowing gas can reach up to 5 meters in height. To get down to the floor of the caldera, you’ll need to tread gingerly on a narrow trail of loose rocks. It takes about 45 minutes to walk down, and another set to get up, but it offers an up-close and unparalleled view of the hellish scene down below. Here, miners with almost no respiratory protection fight noxious gases and sudden bursts of thick ash-clouds. The work is hard and dangerous, and life expectancy plummets to a decade at best. But that’s the price to pay for 600 Rupiah per kilo, or just over US$0.45 per pound – higher than the average wage in the area. As day breaks, the blue flames fade and the miners end their shift. Head back down the trail, which takes about another 1-2 hours. From there, zoom back to the hotel for a quick wash-up, and then it’s another half-day drive to the Bromo Tengger Semeru National Park. Ask your guide to arrange for accommodation inside the park itself. From the small town there, you can appreciate marvellous views of the Mount Bromo and the stunningly desolate lava field below. Where should I stay at the Mount Bromo? Booking.com offers an range of accommodation options, although choices are limited in the national park. Book early as large tour groups will snap up the rooms here. Wake up at 3am to yet another exciting day ahead. 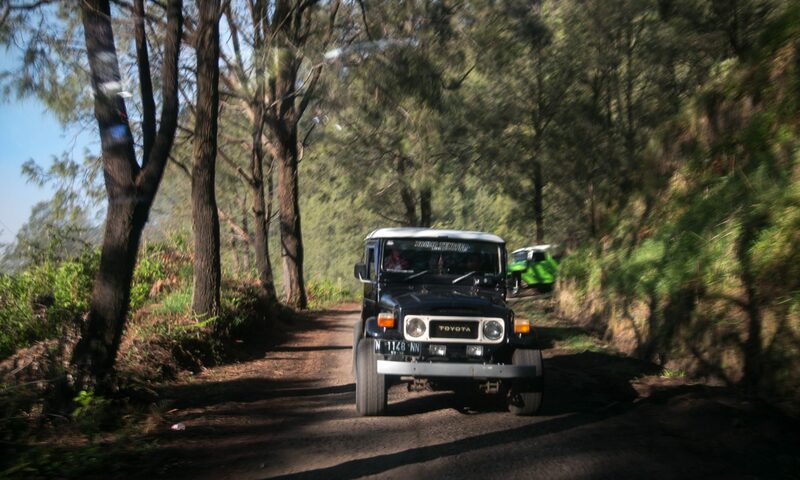 By 3.30am, many rumbling jeeps will set off for nearby Mount Penanjakan to catch the sunrise. You’ll be in good company though, as over a hundred jeeps carrying a sea of tourists all make a beeline to the top. As you reach the viewing platform and the shops at the summit, traffic grinds to a halt and chaos reigns. Follow the horde of bleary-eyed tourists as they stumble into the cafes for some strong Javanese coffee, or camp at the platform to reserve the best spots. If everything goes well, you’ll probably have no more than an hour to kill before sunrise. Each jeep follows closely behind, to avoid losing sight of the path. Eventually, your guide will indicate that it’s time to head out. If it’s too crowded, there’s a secret spot marked by a locked gate that leads to a unfenced slope and clearing. Walk away from the direction of the sunrise, and try to spot locals slipping past the gate. From there, you’ll get an unblocked view of the sunrise, with the mighty Mount Semeru spewing smoke by its side. As sunlight streams in, a lush jungle hugging the sides of Mount Penanjakan reveals itself. After the sunrise, the crowds will disperse into the shops, cafes, or return to their jeeps. Take a nerve-wracking drive down steep slopes and back onto the lava fields (also known as the sea of sand). The guide will stop the jeep for an extended photo-taking session. Backdropped by Mount Bromo, standing over fine black sand and posing with a cool-looking jeep, this is a visual feast for the eyes. Well, you could even build a sandcastle if you wanted to! The last part of this leg involves climbing up Mount Bromo and peeking into the smoking caldera. All jeeps are required to park a kilometer away from the volcano, and you’ll need to proceed on foot. Walking on a sandy flat surface is easy but slow. Expect to take 30 minutes each way, and factor in extra time for plenty of photos along the way. If you’re tired or just want to visit the volcano in style, consider riding a horse there. It’ll cost you, of course, but you get to avoid the horse dung all over the path there. Between the drop off point and the volcano, a seemingly out of place Hindu Temple stands stoically. Pura Luhur Poten is an important place of worship for the local Tenggerese people. On the 14th day of the Kasada month on the Hindu lunar calendar, the locals will celebrate the festival of Yadnya Kasad. Famously on this day, devotees sacrifice chickens, goats or vegetables by launching them from the rim and into the caldera. At the base of the volcano, a narrow stairway helps visitors scale the steep incline. Patience is the order of the day, as the crowd shuffles uneasily and halts every few steps. Keep at it though, and you’ll be rewarded with stunning views of the surrounding lava field and beyond. From the rim, peer down and face the fury of the active volcano, as smoke billows loudly from deep beneath. Once you’re done with the view, head back the same way you came from and get into the car. Your itinerary is almost completed, but there’s still one last place to go! A short distance out of the Bromo Tengger Semeru National Park, take a short detour to visit the Madakaripura Waterfall. This unassuming location hides a small canyon with a remarkable waterfall thundering down its expansive rock face. From the main entrance, buy a ticket (20,000 Rupiah) and take along only your waterproof items. To get to the real entrance though, hitch a motorbike ride. It follows a meandering river, passing by verdant paddy fields and landscaped plantations. Alas, no. That’s just a mundane waterfall. The guide will prompt you to follow him, and eventually you’ll need to wade into the river. Just past the bend, a thundering noise gets increasingly louder. And then you finally see it. 100m directly above you, water leaps out and crashes into the pool below. The river is relatively fast flowing, but you can easily fight the current by picking the right path between rocks. You can walk right under the waterfall and let the curtain of water crash onto you. You can climb on rocks and pose for countless variations of photos. Eventually, the thrill wears off. Head back to the main entrance via the same way – 30 minute walk, 5 min motorbike ride. There’s still some distance to go before you reach Surabaya, so take a rest and enjoy the Javanese countryside scenery until the urban sprawl takes over. From Surabaya, you can head to neighbouring Semarang and take a ferry to the Karimunjawa Islands for some rest & relaxation on an island paradise! Alternatively, check out vibrant Malang, just3 hours away by car. Incredibly beautiful place and inspired post Gary. This area of the world is getting quite some pub with Agung starting to erupt on Bali. The beauty of the region and the absolute brutality of the miner’s work are both out of this world….as well as overall vibe. Quite different than here in NYC. This itinerary is perfect for travellers who love adventure. Inspiring! And from surabaya you can take a short flight to Bali.